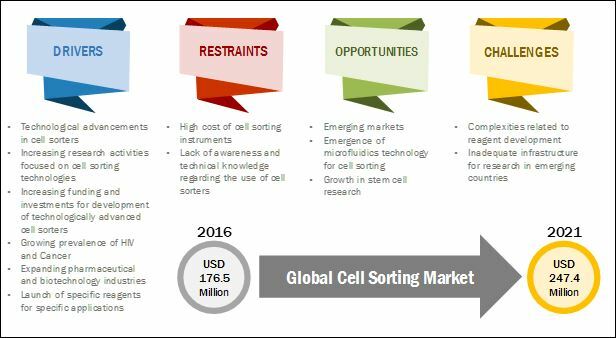 [167 Pages Report] The global cell sorting market is projected to reach USD 247.4 Million by 2021, at a CAGR of 7.0% in the forecast period (2016-2021). Factors such as technological advancements in cell sorters, rising funding and investments for development of technologically advanced cell sorters, and growing adoption of cell sorting techniques in research activities are driving the growth of global Market. The market is further driven by factors such as the growing prevalence of HIV/AIDS and cancer, expanding pharmaceutical and biotechnology industries, and launch of specific reagents for specific applications. However, factors such as the high cost of instruments and lack of awareness & technical knowledge regarding the use of cell sorters are hampering the growth of market. Geographically, the market is segmented into North America, Europe, Asia-Pacific, and RoW. Among the four geographic regions, North America is estimated to command the largest share of the market in 2016, followed by Europe and Asia-Pacific. Emerging markets, including India and China, have become attractive destinations for companies engaged in the development and marketing of cell sorters. Rising incidence and prevalence of cancer, HIV, leukemia, thalassemia, and Alzheimer's disease is among the major driving factors for the growth of this market in China and India. For instance, according to the World Cancer Report 2014, China is witnessing an alarming rise in cancer incidences-it saw an estimated 3.07 million new cancer cases in 2012, accounting for 21.8% of the global new cancer cases. As many as 2.2 million cancer deaths (26.9% of global cancer deaths) were reported in this country in the same year. In addition to this, increasing research initiatives, expansions by key players, and technological advancements are the key factors propelling the demand for cell sorters in the emerging markets. As of 2015, Becton, Dickinson and Company (U.S.), Beckman Coulter, Inc. (U.S.), and Bio-Rad Laboratories, Inc. (U.S.) dominated the global cell sorting market. In the past three years, these companies adopted product launches, product showcase, agreements, and partnerships as their key business strategies to ensure market dominance. Miltenyi Biotec GmbH (Germany), Sony Biotechnology, Inc. (U.S.), Affymetrix Inc. (U.S.), Sysmex Partec GmbH (Japan), On-Chip Biotechnologies Co., Ltd. (Japan), Cytonome/ST, LLC (U.S.), and Union Biometrica, Inc. (U.S.) are some of the other players in this market. Cell sorters are utilized for separation and purification of various cell populations and sub-populations from a complex mixture of cells. A cell sorter separates the target cell population based on their intracellular or extracellular properties (such as protein or enzyme expression; cell size and shape; and presence of specific biomarkers). Key application of cell sorters is in research which includes fields such as immunological research, cancer and stem cell research, diseases diagnosis, and drug development. The global market size is projected to reach USD 247.4 Million by 2021, mainly due to the technological advancements in the field of cell sorting technologies, increasing adoption of cell sorters by various end users across the research and clinical field, increasing incidence and prevalence of target diseases (such as HIV/AIDS and cancer), and launch of application-specific cell sorters. Furthermore, fast growing emerging markets (including Asia Pacific and LATAM countries, among others), emergence of microfluidics technology for cell sorting, and continuous growth in stem cell research are expected to offer new growth opportunities for companies operating in the market during the forecast period. Cell sorting instruments are equipped with advanced features and functionalities, and thus are associated with high cost. Research institutions require a large number of cell sorters to carry out multiple research activities leading to a significant increase in the capital cost associated with the procurement of cell sorting products. Furthermore, academic research laboratories find it difficult to afford such instruments, due to budgetary constraints. This factor is expected to restraint the market growth in forecast period. Additionally, the use of advanced cell sorters having complex experimental setup requires relevant technical experience and knowledge of the latest cell sorter technology. In current scenario, there is lack of awareness among researchers (especially in emerging countries) about newly developed technologically advanced products, this is coupled with a dearth of skilled personnel who can effectively operate and process these instruments. These factors are expected to limit the adoption of cell sorters among end users. Product manufacturer involved in cell sorting market are focusing on new product development as their key growth strategy, to maintain their position in the market and strengthen their revenue base. Companies also aim to differentiate themselves in the highly competitive market by expanding their product portfolios in accordance with industry trends and client needs. Currently, leading market players are focusing on entering new markets by launching technologically advanced and innovative products in both developed as well as emerging markets. Technological advancements such as 'automation' and introduction of microfluidics are expected to fuel the market demand for cell sorters among end users. 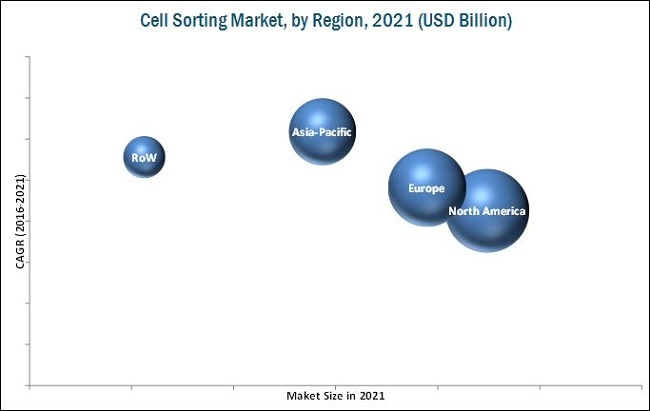 What would be other factors impacting the growth of cell sorters market? Cell sorting market is witnessing advent of easy-to-use bench-top cell sorters. Will the bench-top cell sorters replace the market for high-complexity cell sorters in upcoming 3-5 years? Cell Sorting market is mainly dominated by Becton Dickinson and Beckman Coulter among others. What are key challenges faced by emerging market players to enter market? What are the other alternative/disruptive technologies challenging the growth of market? Till what extent, the low complexity cell sorters (having 2 or 3 lasers) will capture the market share of high complexity cell sorters (having more than 3 lasers and offering multiparametric detection)? The cell sorting market is expected to reach USD 247.4 Million by 2021 from USD 176.5 Million in 2016, at a CAGR of 7.0% between 2016 and 2021. Factors such as technological advancements in cell sorters, rising funding and investments for development of innovative cell sorting techniques, growing adoption of cell sorter techniques in research activities, and launch of specific reagents for specific applications are driving the growth of this market. However, factors such as the lack of awareness and technical knowledge regarding the use of cell sorters and high cost of instruments are hampering the growth of this market. On the basis of technology, the global market is segmented into fluorescence-based droplet cell sorting, magnetic-activated cell sorting (MACS), and micro-electromechanical systems (MEMS)-microfluidics. The MEMS-microfluidics segment is expected to grow at the highest CAGR owing to the easy multiplexing capabilities offered by this technique for higher throughput and low-cost operations eliminating the requirement of skilled labor. On the basis of product and service, the global market is segmented into cell sorters, reagents & consumables, and services. The cell sorters segment is expected to account for the largest share of the market in 2016. The large share of this segment can be attributed to the increasing development of technologically advanced cell sorters, growing research activities across the globe, and growing applications of cell sorting in both research and clinical practices. On the basis of application, the global market is segmented into research applications and clinical applications. 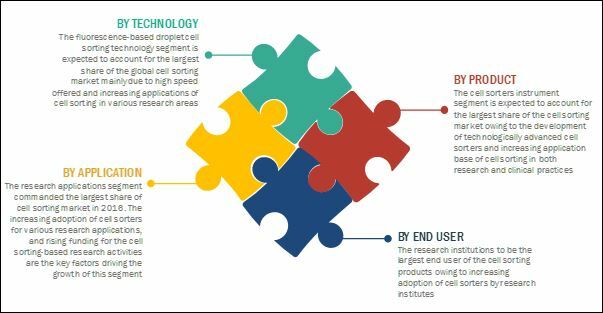 The research applications segment is expected to grow at the highest CAGR during the forecast period owing to increasing adoption of cell sorters in various research applications, such as immunology research, stem cell research, and drug discovery. On the basis of end user, the market is segmented into research institutions, academic institutions and medical schools, pharmaceutical and biotechnology companies, and hospitals and clinical testing laboratories. The research institutions segment is expected to account for the largest share of the global market in 2016, and is expected to grow at the highest CAGR during the forecast period. This growth can be attributed to the increasing adoption of cell sorters by research institutes for sorting various cell populations in shorter time periods as compared to other cell isolation techniques. This report covers the market across four major geographies, namely, North America, Europe, Asia-Pacific, and the Rest of the World (RoW). North America is expected to account for the largest share of the global market in 2016, followed by Europe and Asia-Pacific. The Asia-Pacific market is expected to register the highest CAGR during the forecast period. The high growth of this regional segment can be attributed to growing prevalence of diseases such as cancer and HIV/AIDS, increasing research initiatives, and expansions by key players in APAC countries. The major players in the global cell sorting market include Becton, Dickinson and Company (U.S.), Beckman Coulter, Inc. (U.S.), Bio-Rad Laboratories, Inc. (U.S.), Miltenyi Biotec GmbH (Germany), Sony Biotechnology, Inc. (U.S.), Affymetrix Inc. (U.S.), Sysmex Partec GmbH (Japan), On-Chip Biotechnologies Co., Ltd. (Japan), Cytonome/ST, LLC (U.S.), and Union Biometrica, Inc. (U.S.). 13.9 On-Chip Biotechnologies Co., Ltd. Figure 39 Company Snapshot: Bio-Rad Laboratories, Inc. Figure 41 Company Snapshot: Affymetrix, Inc.